Hartley House, 2320 Rucker, was built by Roland Hartley in 1911 when he became mayor of Everett. He left it from 1924 to 1933 while he was governor and residing in Olympia. Hartley’s granddaughter, Sue Hartley Brown, lived in the mansion with her family, the David Hartley’s, from infancy to age 16. Then the 10,000-square foot building, with an immense basement, attic floors, and roomy garage became a nursing home. The floors were covered with linoleum, the dining room’s leaded glass windows were stored, and the portieres and brocade hangings disappeared. 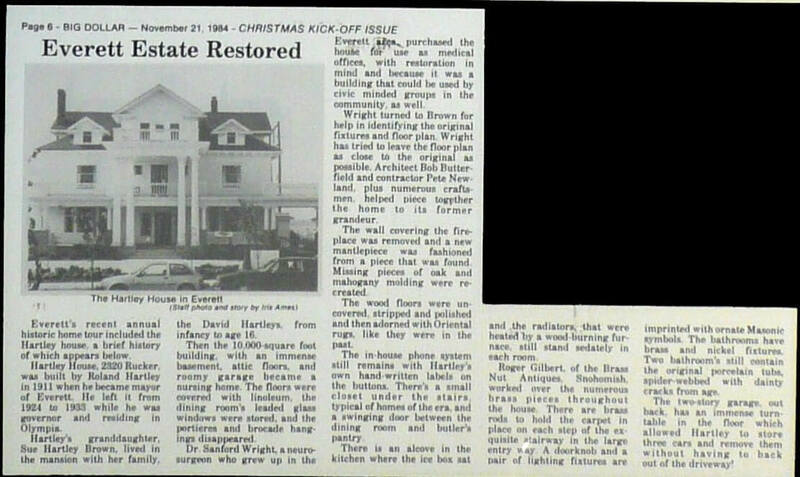 Dr. Sanford Wright, a neurosurgeon who grew up in the Everett area, purchased the house for use as medical offices, with restoration in mind and because it was a building that could be used by civic minded groups in the community, as well. Wright turned to Brown for help in identifying the original fixtures and floor plan. Wright has tried to leave the floor plan as close to the original as possible. Architect Bob Butterfield and contractor Pete Newland, plus numerous craftsmen, helped piece together the home to its former grandeur. The wall covering the fireplace was removed and a new mantlepiece was fashioned from a piece that was found. Missing pieces of oak and mahogany molding were recreated. The wood floors were uncovered, stripped and polished and then adorned with Oriental rugs, like they were in the past. The in-house phone system still remains with Hartley’s own hand-written labels on the buttons. There’s a small closet under the stairs, typical of homes of the era, and a swinging door between the dining room and butler’s pantry. There is an alcove in the kitchen where the ice box sat and the radiators, that were heated by a wood-burning furnance, still stand sedately in each room. Roger Gilbert, of the Brass Nut Antiques, Snohomish, worked over the numerous brass pieces throughout the house. There are brass rods to hold the carpet in place on each step of the exquisite stairway in the large entry way. A doorknob and a pair of lighting fixtures are imprinted with ornate Masonic symbols. The bathrooms have brass and nickel fixtures. Two bathroom’s still contain the original porcelain tubs, spider-webbed with dainty cracks from age. The two story garage, out back, has an immense turntable in the floor which allowed Hartley to store three cars and remove them without having to back out of the driveway.